Islamic State (IS) has used English-language magazines as a crucial component of its propaganda strategy, particularly targeting Muslims living in the West. 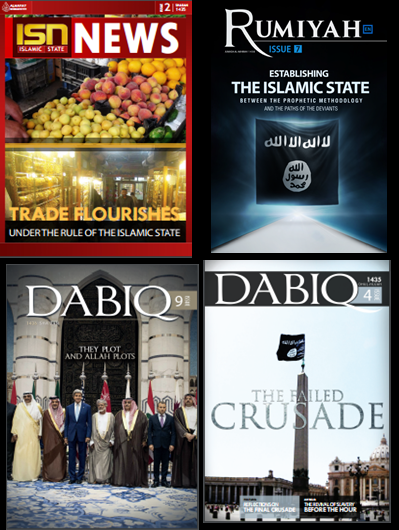 This paper provides a quick reference guide to IS’s English-language magazines released between June 2014 and September 2017 examining key themes and propaganda strategies deployed across three issues of Islamic State News, four issues of Islamic State Report, fifteen issues of Dabiq and thirteen issues of Rumiyah. It concludes by highlighting four trends and their implications for CT-CVE strategic communications practitioners. First, IS use a mix of rational- and identity-choice appeals to provide its various target audiences with a ‘competitive system of meaning’ which CT-CVE strategic communication efforts must seek to dismantle with careful campaign and message design. Second, over the period of 2014-17 IS appears to have deployed a thematic ‘hedging’ strategy characterised by certain messaging themes being prioritised over others during periods of boom versus bust. By identifying the signatures of IS’s use of propaganda ‘hedging’, CT-CVE practitioners can be better prepared to confront current and future challenges from IS propagandists. Third, IS’s English-language magazines must be understood within the context of trends across its broader propaganda effort. To effectively address this multifaceted threat, CT-CVE practitioners would benefit from applying the KISMI (Keep It Simple Maximise Impact) principle of rolling-out a strategic communications campaign. Finally, the appearance of instructional material in IS propaganda highlights the need for post-incident CT-CVE strategic communication plans to undermine the strategic logic of so-called “inspired” attacks.